Reap the benefits of collaborative consumption. 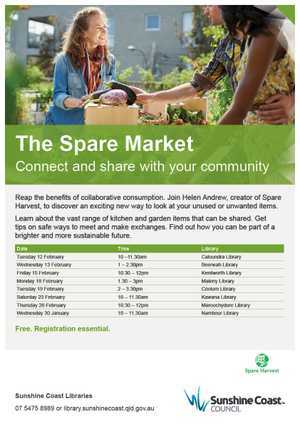 Join Helen Andrew, creator of Spare Harvest, to discover an exciting new way to look at your unused or unwanted items. Learn about the vast range of kitchen and garden items that can be shared. Get tips on safe ways to meet and make exchanges. Find out how you can be part of a brighter and more sustainable future.